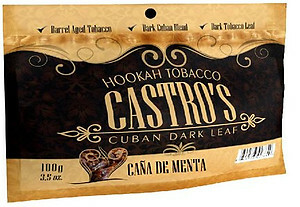 Fantasia Castro's Blend Premium Flavored Tobacco is a fine cut hand crafted Cuban dark leaf tobacco that sets itself apart from the rest by being spicy instead of sweet. 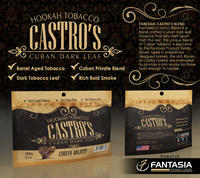 This unique blend of barrel aged Cuban tobacco is exclusive to the Fantasia product family. Slowly aged in proprietary designed barrels, the rich flavors of Castro's blend are marinated to provide a rich smoke for those bold enough to handle it. Fantasia Castros Hookah Tobacco Blend is the right choice for those looking for a reasonably priced brand that offers a strong and flavorful smoke reminiscent of traditional pipe tobacco. Fantasia Castro's 100 gram pouches are perfect for allowing Hookah users to sample and experience an assortment of tobacco flavors at an affordable price. This size is packaged in resealable pouches that will keep your shisha fresh without the need of an additional air tight container. Fantasia Castro is super juicy and even though it will work fine with a slightly denser pack, it produces the best results when using a fluff pack in a phunnel bowl. Always mix up your tobacco to redistribute the juices and then sprinkle it in producing a fluff pack. Just use your thumb and index to lightly drop in the tobacco just under the rim. Fantasia Castro is slightly heat sensitive so start with 2-3 hookah coals depending on the size of the hookah bowl you are using and work your way up to your desired heat level.